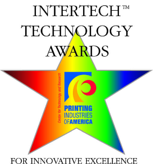 The InterTech™ Technology Awards recognize the development of technologies predicted to have a major impact on the graphic arts and related industries. Read the Solvent Saver overview printed in Graphic Arts Monthly Supplement. Maratek Environmental received The Financial Post Bronze Environmental Technology Award for introducing a recycling process to the printing industry that reduces inorganic and organic pollutants by 95% and cuts water consumption by 90%. Steve Silverstein, President The Journeyman Press, Inc.